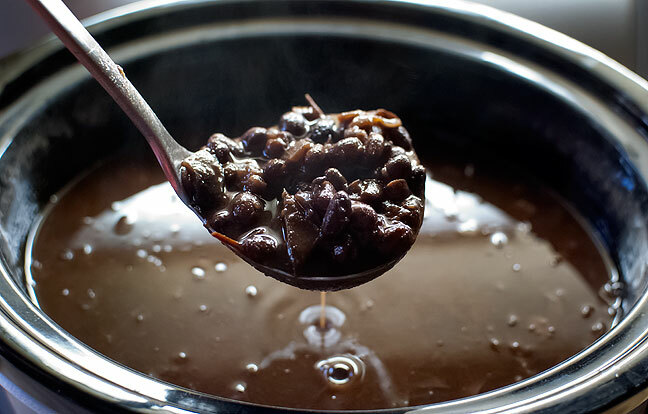 My readers know that last month I made a big pot of pinto beans. Upon coming home for lunch the next day, I was swept away by the excellent smell. It was a really big pot of beans, and it lasted a while. I put them in burritos, ladled them onto scrambled eggs, covered veggie dogs with them, and even ate them straight. For me, beans are delicious, nutritious, affordable, and environmentally friendly. I believe the world would be a far better place if we replaced Twinkies and Angry Whoppers with big, hot bowls of beans. Last night I put on a big pot of black beans. I got up this morning (my day off) to kiss Abby goodbye on her way to work and … mmmmmm. Beans for lunch. I make my black beans with an onion and some tomatoes from the garden. I cook them overnight, then salt them just before serving them. I, too, am a lover of beans. I never met a variety I didn’t like, in fact. Ever enjoyed them rinsed and cold, as a salad additive? Also, tip: pour half a bottle of pace’s medium chunky salsa into your red (or really, whatever variety) bean pot for a nutritional boost and delightful flavor kick.